Edgewater Farmers Market Reviewed by Edgeville Buzz on September 16, 2010 . 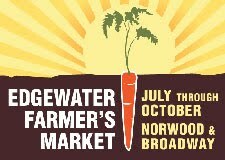 Don’t forget, the Edgewater Farmers Market is still running – every Saturday through October 30th from 8AM – 1PM at Broadway & Norwood. The Market features farmers, experts, and artisans selling everything from produce, jams, and fresh bread to coffee, flowers, and hot sauce. Educational and entertaining programming planned for the 2010 season includes tours of True Nature’s new beehives, talks from Nate the beekeeper, and much more.